That moment when you look at the clock and realize you've been up the entire night... and it doesn't even matter. Frequenters of the blog will notice the massive overhaul of design, but the biggest (and best) of the changes is our new home - Frayed Threads is now located at www.frayed-threads.com. The old address will forward you (obvs), but be sure to update your bookmarks so that you can keep up with all of my fashionable awesomeness. And because I know it may cause outrage among some, yes, there is a naughty word in my title image. You'll cope; those of you who can't probably shouldn't be reading this blog anyway. Witness how much I just don't care. And then check out this post for the inspiration behind this redesign. I took these photos in the dam spillway the other night; I couldn't remember where it was until I accidentally drove by it last weekend with my sister. The last time I walked through it (years ago - think high school era with my friend Brian) it was full of grafitti and thus would have been perfect for a photo shoot featuring a colorful print such as the one on my newly acquired trousers from Zara. Alas, however - it seems the city has gone in and cleaned things up since then, and has done a fairly decent job of maintaining it. There are only a few bits and pieces of street art remaining; my favorite being this piece of faded wisdom I found where the spillway meets the road. try harder. It's been my mantra of late, so finding it spray painted on the cement was a piece of happy fortune. They're even on sale - for a mere $693. Check out the picture book version of this post on Pinterest. Holy pants, I love those! and the new redesign looks good, glad you are doing exactly what you want! Thanks!!! 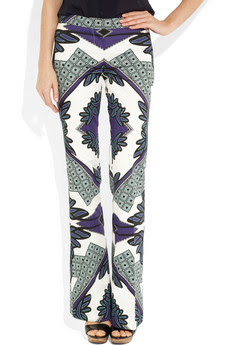 There is a tiny part of my brain that is trying to rationalize buying those Derek Lam trousers... I just have to keep reminding myself that I shouldn't buy a pair of pants that are worth more than the vehicle I drive! I love those trousers!! I want them... & "Try Harder" is a brilliant motto to live by. Thanks Morgan! I love them too! They feel like wearing pajamas. Definitely a worthwhile investment. Those pants are so freakin' awesome (and they look super cozy)- loving these style shots! Also, thank you for being an awesome part of the StyleSaint community. And these pants are probably the most comfortable thing that I own... I kinda want to wear them every day!